Description For your perfect pout, buy WUNDERKISS GLOSS LIP LINER + WUNDERKISS LIP PLUMPING GLOSS & receive a FREE WUNDERKISS ESSENTIAL LIP SCRUB! WUNDERKISS ESSENTIAL LIP SCRUB hydrates and exfoliates away any dry skin to reveal soft & supple lips. A combination of sugar particles and shea butter, this formula deeply moisturizes and smoothes the lips instantly. Use as the first step of your lip routine. Define your glossy lip look with our ‘first of its kind’ GLOSS LIP LINER. Use our unique glossy formula on the outside of the lips to create a beautiful, long-lasting lip contour that keeps your lip gloss in place. An extreme lip plumping gloss that gives you hydrated and naturally plumper looking lips in minutes. 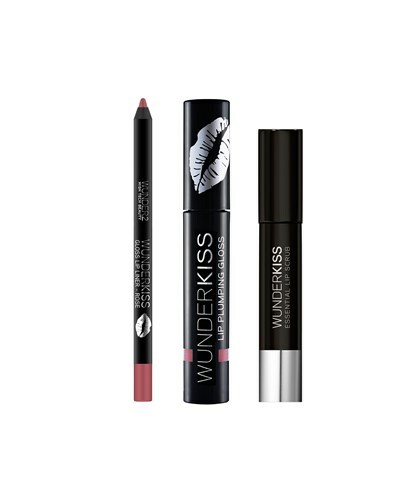 WUNDERKISS LIP PLUMPING GLOSS is infused with a concentrated lip plumping complex, which as you apply will give you a sensation of heating and cooling for plumper, more kissable lips.